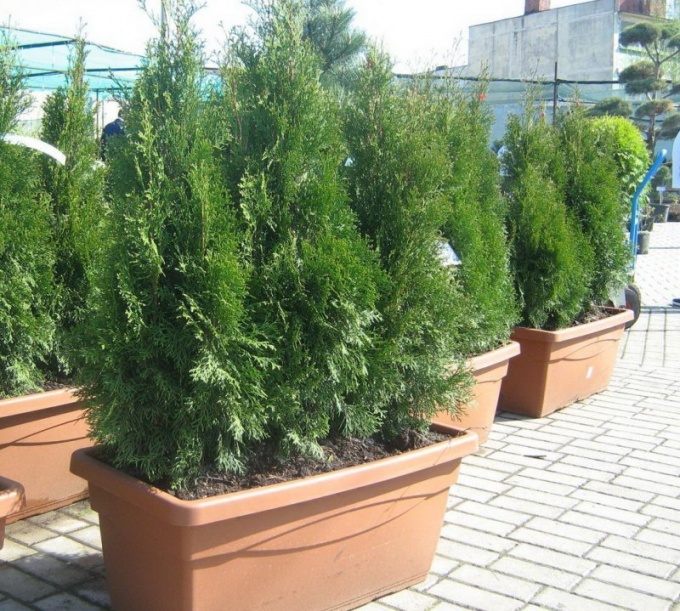 Not all types of cypress and arborvitae can be grown at home in a pot, but some are still adapted to this existence. They help to create a good climate with the scent of coniferous forests. The main problem, not allowing to keep in the apartment conifers - too hot and dry air. Of the other adapted to this cypress macrocarpa, native to California. In the natural environment this tree sometimes reaches 25 m and in a pot on the windowsill can grow a maximum of 1.5 - 2. If the conditions of life for cypress suitable, it can live for many years. For cypress are not afraid of low temperatures, but dry and hot air during the heating season can quickly destroy the plant. To feel good, cypress needs to be wintering at 5-15°. The only solution is to put the plant on the insulated, but unheated loggia for the winter, or raise it without a rest period, spraying twice a day with cool water during the heating season. Cypress likes bright diffused light. Direct sun can occur burns, causing the plant off diseased branches of the needle. This tree develops well in partial shade, especially outdoors. Cypress grows well in constantly wet ground, this water it liberally and frequently, especially in summer. In the wintering period, reduce watering to one time per week, as the cypress in this time almost not growing and recycles the water. TUI belongs to the family of cypresses, and the conditions of her detention in the apartment similar to him. In nature, arborvitae is native to North America and Eastern Asia but adapts well to various living conditions, including the pot on the windowsill. Thue need a cool room, only she will be able to develop normally and to allocate phytoncides in the air, filling the house with the scent of pine needles. In this tree grows up to 2 meters, and likes a temperature not exceeding 20oC in the summer. Often in the summer, fifth removed from the window sill to cool and in the shade so she didn't get sunburn. It does not require a lot of sunlight, and ambient lighting throughout the year is enough. Thuja watered little and often, so the soil never dried out. Very grateful to this plant responds to spraying in both winter and summer. In dry air at Thue often appear pests spider mites, aphids, and scale insects. Weakened plant under such conditions can die, so it's easier to prevent infection, maintaining a constant spraying on the plant high humidity. You can grow th from seed - in this case it will be more adapted to dry air. This conifer after a few years make excellent bonsai.